Lawrie Shabibi and the artist. Photo: Pekka Niittyvirta. Lawrie Shabibi is pleased to present Immortals by Adel Abidin, the artist’s second solo exhibition at the gallery. Abidin has embarked on a radical shift in his artistic practice by returning to painting, for the first time since 2003. Immortals takes a playful look at the manufactured nature of Arab media and raises important questions of the role that it has played in shifting geographic boundaries and allegiances. The show comprises large-scale oil paintings and a hand-painted site-specific installation, entitled Breaking News. 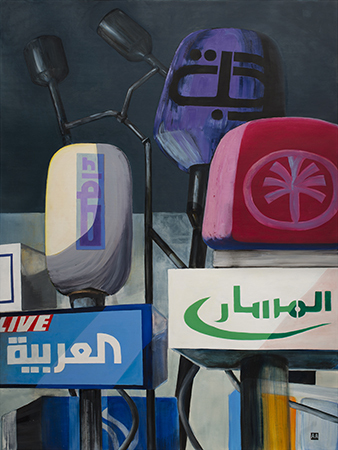 Abidin takes his cue from the visual content and images of Arab news channels. The role of these news stations has become increasingly significant in the spread and containment of ideologies, revolutions and counter-revolutions. These often share similar graphics, blinking text, and staged TV press conferences, all of which Abidin sees as formulaic. Since the start of the Arab Spring, like many from the region, Abidin has felt impelled to follow the news. Eventually he began to switch off from the content, focusing instead on the visual impact of the presentations and in particular on the plethora of colourful microphones, set before the speaker almost concealing his face. Thus his starting point for each of these paintings is these microphones, making them—rather than the spokesman—the focus of the works. Abidin conveys these microphones as large-scale figurative arrangements, vibrant lollipops or playful toys. By appropriating and re-proportioning these nominally innocent objects, they become tantalizing messengers in their own right, forceful vehicles of propaganda, legitimizing the absent speaker implied by them. Adel Abidin (b. Baghdad, 1973) received a bachelor’s degree in Painting from the Academy of Fine Arts in Baghdad in 2000 and a Master’s degree in Media and New Media Art from the Academy of Fine Arts in Helsinki in 2005 where he continues to live and work. Abidin has exhibited in numerous group and solo exhibitions, most recently in: Home Ground: Contemporary Art from the Barjeel Art Foundation, Aga Khan Museum, Toronto; Anxiety and Other Ways of Being, Rapid Pulse International Performance Art Festival, Chicago; All the World’s a Mosque, Bardo Museum, Carthage; Face to Face, KIASMA Museum of Contemporary Art, Helsinki; Aide-Mémoire: Footnotes, Barjeel Art Foundation, Sharjah; Culture of Peace, Lajevardi Collection, Tehran. His works are featured in major collections including: National Gallery of Victoria, Melbourne; Sharjah Art Foundation, Sharjah; Mathaf: Arab Museum of Modern Art, Doha; KIASMA, Helsinki and Espoo Museum of Modern Art (EMMA), Helsinki. Lawrie Shabibi is a contemporary art gallery housed in Dubai’s Alserkal Avenue. The gallery’s programme supports international contemporary artists mainly from the Middle East, North Africa and South Asia. By holding a regular programme of exhibitions, screenings and talks, and participating in international art fairs, the gallery engages the wider local and international community. The gallery represents Hamra Abbas, Adel Abidin, Shaikha Al Mazrou, Farhad Ahrarnia, Wafaa Bilal, Asad Faulwell, Nadia Kaabi-Linke, Yazan Khalili, Taus Makhacheva, Nabil Nahas, Driss Ouadahi, Shahpour Pouyan, Nathaniel Rackowe, Marwan Sahmarani, Larissa Sansour, Yasam Sasmazer, Mona Saudi and Adeel uz Zafar.